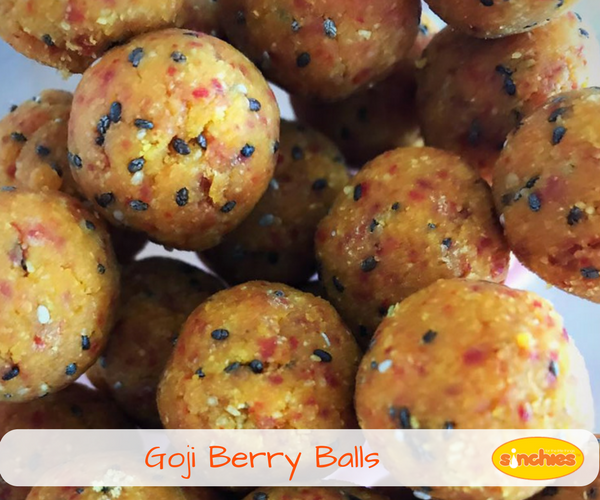 We love goji berries in this house as much as we love chia seeds and add them to whatever we can. My little ones daycare is nut free so i'm always trying to make up things that are healthy, nutritional and don't contain nuts. A friend forwarded me a recipe for some nut free balls, but i didn't have pepitas or sunflower kernels so used what I had and these turned out perfectly. My little one devoured them which I always love seeing. Using a 1/2 teaspoon measure, scoop out mix and place each scoop on a plate or chopping board. Wet your hands and then roll the mix into balls.